Violent protests in the Iraqi city of Basra have all but ended U.S.-backed Prime Minister Haider al-Abadi's chances of winning a second term and shattered Washington's hopes of shaping the next government. Fifteen people have been killed protesting against power cuts, polluted water, poor services and perceived corruption in Iraq's second city, many of them in clashes with security forces. But Sadr has condemned Abadi's management of the Basra crisis and is in advanced talks with the Fatih coalition, led by popular Iranian-backed Shi'ite militia commander Hadi al-Amiri, to form a new alliance, sources close to the talks told Reuters. "Talks between Fatih and Saeroon are serious and could lead to a breakthrough in the political crisis soon," said lawmaker Razzaq al-Haidari, a member of Amiri’s Badr Organisation. "That's what we (Saeroun and Fatih) agreed on, so Amiri has withdrawn his candidacy. And we agreed that Abadi isn't eligible for a second term," the source said. "Abadi's failure in managing the Basra crisis totally convinced Sadr that supporting Abadi will put his status and popularity among millions of followers on the line," said Baghdad-based analyst Ahmed Younis. The collapse of Abadi's candidacy would reduce the U.S. sway over politics in Iraq, where it competes with Iran. Tehran has steadily increased its influence in the country since a U.S.-led invasion toppled Saddam Hussein in 2003. The protests in Iraq's south, the country's main oil hub, mark a rejection of the political establishment that has held on to power with the support of the United States and Iran despite failing to improve people's lives. During a visit on Monday to Basra, which is in the heartland of Iraq's Shi'ite Muslim majority, Abadi was met by protesters who demanded he leave the city. Abadi's office was not available for comment. Political gains from Abadi's victory over the militant Islamic State group in Iraq last year, with U.S. support, proved short-lived and the problems in Basra have put years of government failures in sharp focus. "The message from Basra is loud and clear for all political elites," said Ali al-Mawlawi, the head of Research at Baghdad-based Al Bayan Center. "They’ve realized, if you like, that there's a ticking time bomb." There are no guarantees that Tehran can mold Iraq's political landscape without a struggle. Many voters who supported Sadr in the election are disillusioned with the Iranian-backed political elite they accuse of corruption. Sadr and Abadi's union was fragile from the start and had already been showing signs of strain before Saeroon's leadership, and then Fatih's, called on Saturday for Abadi to resign after an emergency parliamentary session on Basra. "That was our declaration that this was the end for Abadi and his second term," said the senior source in Fatih. In a clear reference to Abadi and others, Iraq's top Shi'ite cleric, Grand Ayatollah Ali al-Sistani, whose interventions can bring down politicians, condemned the neglect of Basra and called for an end to the old guard. But Iran has also been trying to shape the next government in Iraq. Senior Iranian delegations have been in the capital Baghdad for several months, trying to convince divided Shi'ite factions to unite behind one candidate for prime minister. Mojtaba Khamenei, the son of Iran's Supreme Leader, Ali Ayatollah Ali Khamenei, has also visited Baghdad for talks with Amiri and Maliki, three political sources said. Success is not certain for Iran. 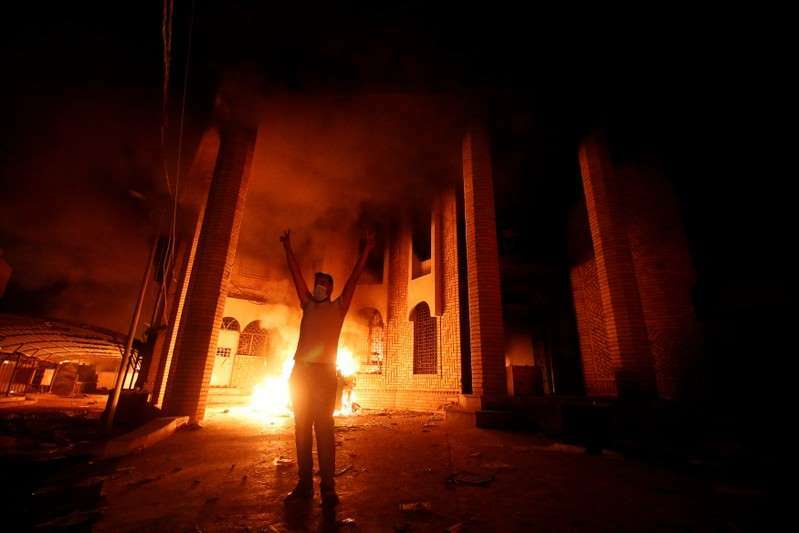 Protesters in Basra set fire to the Iranian consulate and chanted "Iran out, out", a warning of the risks of being too close to outside influences. "The way the Americans and the Iranians have viewed Iraq until now is if they back their horse, they can control the country," said Renad Mansour, an Iraq expert at the Chatham House think-tank in London. "What this new potential coalition is saying – or at least what the Sadrists are saying – is we don't have a problem with international affairs. But you can no longer treat us as your proxies. We're not your proxies, we're your allies."